Near the end of this book Michael Cooney admits that its working title was “We weren’t as bad as we seemed at the time” (p253). While the actual title is a good one, capturing as it does the slow-motion car crash that was the Gillard government, the working title was pretty apt too. 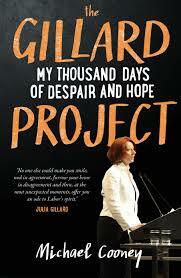 This book proudly proclaims the fact that, despite the drama and intrigue, this was a government that passed a huge amount of progressive legislation (especially in comparison with its successor) and that there was a definite Gillard Project of education, health, employment and disability funding. Until I’d read Don Watson’s Recollections of a Bleeding Heart, I hadn’t particularly considered the nature of a speech-writer’s role. I found it hard to distinguish the voice of the invisible speech-writer from the speech-giver (and still do) in such a strangely symbiotic relationship. Michael Cooney came to the job as Gillard’s speechwriter as a Labor man after working as policy director for Kim Beazley and Mark Latham, and as founding policy director of the progressive think-tank Per Capita during the Rudd years. He comes from the Catholic right-wing of the party, a pedigree which I’m not particularly keen on, and which I find puzzling given that Gillard was from the left. But there is no doubt of his admiration for Julia Gillard. My favourite chapter of the book is an interlude titled ‘The Shy Child’, extracts of which appeared in this Fairfax article, where he emphasizes her humour and downright decency. It comes through in the other chapters as well, as he chronologically traces through the frenetic “just do it” attitudes of the early months of the Gillard government, her performance overseas, and then the awful, drawn out ending. Now I know you’re not all in love with the language of ‘spreading the benefits of the boom’. I know everyone here works hard competes in a tough global environment; you take big risks and you earn the big rewards. You build something. Australians don’t begrudge hard work and we admire your success. Cooney fesses up, as well, to the speeches that bombed, most particularly the “we are us” speech that she gave to the 2012 ALP conference, to which he devotes a whole chapter. Because this is a book written by a speech-writer, he is able to give the draft of the speech that was not given, but he doesn’t resile from responsibility for the “we are us” phrase that was ridiculed so widely. “The speech” he admits “was by far the worst moment for the prime minister that I had real responsibility for” (p 136). I had starting reading this book some weeks ago after picking it up from the ‘New Books’ table at the State Library while waiting for material to be delivered to the Manuscripts Reading Room. It engaged me instantly, and so I suggested that it be purchased by my local library, which subsequently obliged. I must confess that I found it harder to get into the second time, but by half-way through I was hooked again. It’s an insider’s book, with names dropped and allusions made, very Canberra-centric and Cooney does not make any pretense over where his loyalties lie. We’ve had the recent, depressing airing of “The Killing Season” and it’s certainly an antidote to that, just as it’s an antidote to the Government’s announcements of its carbon reduction target and quashing of the marriage equality bill. I doubt that it will have the longevity of Don Watson’s Recollections of a Bleeding Heart but it’s a good read for now.